I can’t believe it’s been 25 years. Happy anniversary, Macintosh. This is from Tom Kuhr, a member of the OleOle startup team. He blogs over at Kuhr Strategies. This is his list of tips on what kills it, and also what improves site conversion. Things that kill conversion are few, the biggest issue is creating a need for registration. A clear reason to convert, which should be spelled out in the context of a page for a new user. “If you want to this, just sign up here. You’ll also be able to other features”. The initial request should have a clear benefit to the user. I’ve been doing very simple company sites, and frankly, they don’t need too much information architecture. Think about it — how many different ways can you display a case study? What else is there to use other than About Us? Most of the company sites I’ve been designing have been fairly static. For new ideas, I’ve been popping over to Template Monster. They have pages and pages of ideas, and if you want to pick one, the designs are fairly cheap, usually around $70. Not bad, considering you get the PSD file to start from. I wonder when there’s going to be an Information Architecture Monster. A company located in Denver, Colorado are looking for a senior level Lead Experience Architect with strong interests and capabilities in the rapid development of Rich Internet Applications. The ideal candidate will thrive in a work environment that requires strong problem solving skills and independent self-direction, coupled with an aptitude for team collaboration and open communication. The candidate will also have extensive experience in a fast-paced and innovative development environment. A thorough understanding of user-centered design methodologies is a must. Solid academic background in human-computer interaction or related field (BS or MS in Computer Science or related field a big plus). Experience with activities and deliverables associated with user centered design, SDLC, and functional requirements gathering. Excellent leadership, communication, project management, and teamwork skills. I love LaCie products. I have a few of their hard drives sitting on my desktop (there’s something very manly about having close to 2TB of storage),and I love their industrial design, especially the Porsche drives. Llet’s just say a few weeks ago, one of the power supplies died. (Well, it didn’t die, I cut the wire accidentally while the hard drive was on). Over to the LaCie website, their website is as elegant as their products. It’s clean as hospital white sheets, and very easy to shop there (like any online shop should be). Most importantly, when shopping for parts, the website list the name of the product, show a thumbnail of both the drive and the connector type. The only failing is no buy now button. 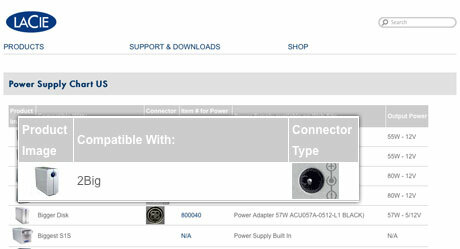 But I clicked on the part number, and was on my way in minutes. Why don’t more sites do it this way? From Kottke, still relevant after all these years. The robots.txt blocks certain directories from being indexed by search engines like Google — which means it also blocks archival for things like legal proceedings. For obvious reasons. If you look closely, you can see George W. Bush leaving — for the last time. The new Obama site is a thing of beauty. A large consulting company is seeking several .NET experts with five years of .NET programming experience. The selected candidates will work in small groups on multiple software development projects, and will work closely with the assigned Project Managers to deliver quality solutions to our client companies. Excellent interpersonal and organizational skills, ability to handle diverse situations, multiple projects and rapidly changing priorities. Ability to communicate with clients at all levels. Ability to come up with the best solution for given requirements. Ability to provide reasonably accurate estimates for projects, based on client-provided technical and functional requirements. I’ll admit it, I’m not a big Soccer fan, but I get Ole Ole because it’s this social network that services the biggest base of sports fans in the world. Remember, the world speaks different languages and they happen to use the internet, so why not? OleOle is the perfect example of not only why you should translate your blog into different languages (they have translated the site into 10 different lanuages, including Japanese, Chinese and other asian languages), but how to do it effectively. 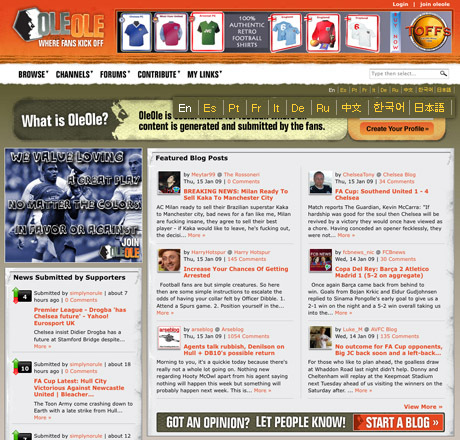 Because of their approach, OleOle has attracted an international audience. Not everything is translated, but enough of it to make it very usable for the user. OleOle also makes it very easy for a user to signup, in 10 different languages. At the very least, limit the amount of text that is in graphic format so the users can use Google to translate the site, or copy and paste it into their own translation program (I’ve seen users do that). Make it as simple as possible. The reason that I used “Unsere Dienstleistungen” is that’s the German translation of “Our Services”. If you are localizing a website, have you considered that the site’s going to look like in German? Chinese? Spanish? Is there a color in the design that’s okay in Korea, but not okay in France? Does the IA work in English, but not in Hebrew? Many of the major content management platforms, open source and commercial, have extensive support for localization, but supporting those other languages has a new set of requirements. Have you designed the site with this set of requirements? Here’s a few tips to think about while you are going through the design process. Did you know that some languages read from right to left? Can you imagine having to develop this functionality for Israel as a browser developer? 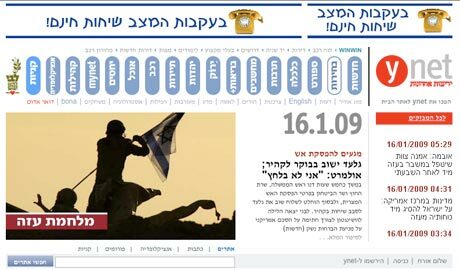 For example, YNet News is an Israeli publication published in English, but the Hebrew edition reads right to left, so the navigation is completely different. Or that publications that are online for Quebec citizens use a different dialect of French than France. Or Spanish used in Mexico has significant differences than Spanish spoken in Spain. Those differences should be researched up front, and considered during every step of the design process. For example, there are 31 different forms of address formats in world. How are you going to design that contact form again? On of the major client’s branding had been set for months. About a week before launch, someone asked what the implications of the color were for, say, the Korean culture. After review with the branding agency and the client, the color of the logo (and much of the design), was changed. About.com has a great post about what certain colors mean in certain cultures. It doesn’t mean that we all should design everything in black and white; it’s just meant to limit misuderstandings. As you can see by the headline, certain languages (German, for example) are very, very verbose. Other languages (Chinese, Japanese, and Korean come to mind), can say the same thing in a few characters. Every language is different, and even adult sites know that the best thing to do is to hire a good translator instead of having an application translate the text, if there’s a budget for it. Take your Photoshop mockups or HTML clickthroughs and use Google Translation tools to test your designs. If it fails the German test, reconsider your design. This planning saves weeks of time later on changing the site, and setting up the site at the beginning this way familarizes your staff on how to edit the content areas. Many content management systems have separate files for each language, and editing of the content happens with the files. The red-headed stepchild with the plain sweater in content development is the copy writer; rewriting the same copy in different languages mean the same copy will read poorly in more than one language, and a straight translation from Google is not the way to go. Go with writers that are native in the core language, and can communicate clearly in the other language. There’s a lot of dialects and other colloquialisms that are missed is the person isn’t a native speaker, and that makes a big difference in how the site reads. Or, how would you like your client to be the object of ridicule on a Chinese message board? Airplanes pretty much fly themselves today — other than making sure things are working correctly, pilots don’t have much to do when something bad happens. Example: today’s US Air 1549 flight that crashed into the Hudson River. The Miracle on the Hudson, they’re calling it. I don’t think it’s so much a miracle — it’s a job well done. Airbus and Boeing spend millions of dollars in analysis to make sure the user experience of their airplanes is easy to use, and can be used in just about scenario, including this one: a bird strike causing an engine failure. The user experience from allowing the pilot to land the plane in water to getting every single passenger off the plane before it sank is meticulously planned and tested, over and over again. It’s not just a miracle that they survived: it’s intense planning and testing that allowed for this to happen, like a movie script. Most of our jobs don’t have a life or death aspect to it, but sometimes user experience is life or death. Think about this: there hasn’t been a major airline crash in the U.S. in seven years. That’s amazing, if you think about it. Good user experience plans for user mistakes and eliminates risk. This is the perfect example. Congratulations to the pilots and the engineers at Airbus for a job well done. Too bad for Boing Boing — bad timing. I can’t tell you how many times I should have written some kind of contract in dealing with the client; you get down the line, and pretty soon there’s a disagreement on who’s responsible for what (“What do you mean we have to write the copy? You’re the web designer!”). Trust only goes so far, and when that trust is broken, it’s always the client that has the upper hand — and the checkbook — when there’s a disagreement and no contract in place. When there is a contract, how one-sided or another it is shows how far you can trust a client. Most clients should appreciate signing a contract; like in Jerry Maquire, no handshake is as strong as oak. I’ve lost thousands of dollars and a lot of sleep over this. Now with most of the clients I work with, there’s some kind of contract in place. It almost never gets to the details, but usually it ensures there’s some kind of understanding in place of who’s going to do what. 24 Ways has a great post in what needs to go into the perfect contract. Read on. He even includes a sample to use as a starting point. I’m going to add my opinion under each snippet. “The great thing about the Internet is that it gives everybody an opinion and a venue to express it,” Mark Bauerlein, a professor of English at Emory University in Atlanta, said in a recent phone conversation. “The bad thing about it is that it gives a venue to everybody with an opinion. Sure. But these are conversations I have every day with my friends, my parents. At least they are polite enough to just nod their heads and agree. There are statistics to point to in this regard. A survey by the National School Boards Association indicates a very large number of students spending around nine hours a week doing computerized social networking and another 10 hours watching television. Other surveys show a majority of high school students doing an hour or less of written homework a day. There are lies, more lies, and damn statistics. I watch much less television than my parents. How come no one reports on that? That’s a school problem. If the teachers aren’t giving out enough homework, then something’s wrong with the system. For that matter, there’s always been uneducated masses, and somehow there’s this assumption that everyone should be able to write like Nathaniel Hawthorne. That’s entirely not something I’m not interested in on any medium. And then there’s Facebook and the other social networking devices that were created for young people – specifically at college campuses as a way for new students to be introduced to their communities – and have been adopted by older ones to do exactly what their children spend too much time doing. Language changes. People’s habits change. Networking changes. Just because older people adopt it doesn’t make it bad: it just means the product management group of that site understands target audiences. Some of us use the Facebooks, LinkedIns and MySpaces of the world for more than just reporting, “I think I’m going to eat corn flakes this morning” (which is close to the message I had for my activities for the day). It’s a way of connecting in the crazy world with some of our friends that is both professional and personal. Social Networking has been around for as long as there were two people on this Earth, and just because the form is different doesn’t make it any less important. It’s really up to us to take the tools of the day and teach our children how to use them more effectively. Right? Every once in a while, I throw a question out to LinkedIn, and publish the answers here. I’ll probably be compiling the “best of” in a final post. Tracy Hartlzer is a product manager type just recently with PayPal, and is a real standup guy; I’d hire him in a second. Signal vs. Noise has a great little article about headline conversion rate. They used Google’s Website Optimizer to see how each performed, basically five headlines outside of the first one over 4,000 page views. The results are interesting, yet predictable. Are you testing your headlines? Would you spend a little time to see a 30 percent improvement in conversion rate? What would you do for a whopper? 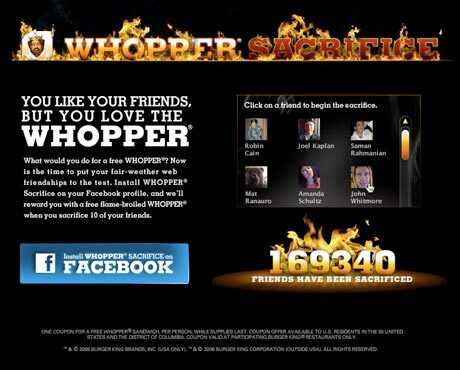 This is a great application for Facebook and website that creates some fun in exchange for free food. I don’t know if it will result in extra sales, but this is exactly a fun way to attach a reward component to social networking. And, it’s been very successful from an awareness standpoint (Other posts at The Future of Ads, Inside Facebook). What do you think?